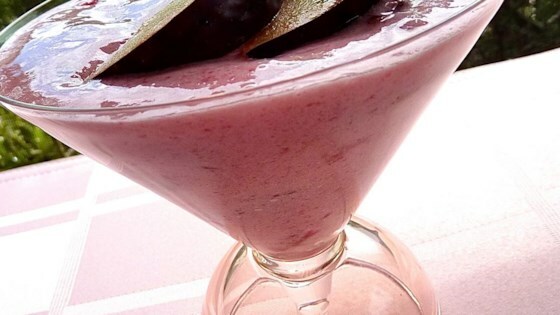 "This is a delicious fruity mousse with a great plum tang, making good use of pre-stewed plums, especially handy at that time of year when you have too many plums and quite enough jam, thank you very much! The preparation time is mostly waiting time for the mixture to chill sufficiently." Place the plums into a saucepan over medium-low heat, cover, and simmer, stirring occasionally, until the plums are soft, 5 to 10 minutes. If the mixture becomes too thick or starts to burn, add a tablespoon of water. Remove from heat, and allow to cool. Dissolve the gelatin in 1/2 cup of hot water in a bowl, and stir in the cooled plums, sugar, and lemon juice. Mix until the gelatin and sugar have dissolved. Chill the plum mixture in refrigerator until it begins to thicken, about 30 minutes. Whip the evaporated milk in a mixing bowl with an electric mixer until thick, then gently spoon the whipped milk into the plum mixture. Beat again with electric mixer until the dessert is fluffy and well combined. Chill for at least 3 hours before serving. This didn't turn out for me, maybe I didn't whip milk long enough. I might try it again. I had a ton of yellow plums I needed to use and they made delicious flummery!